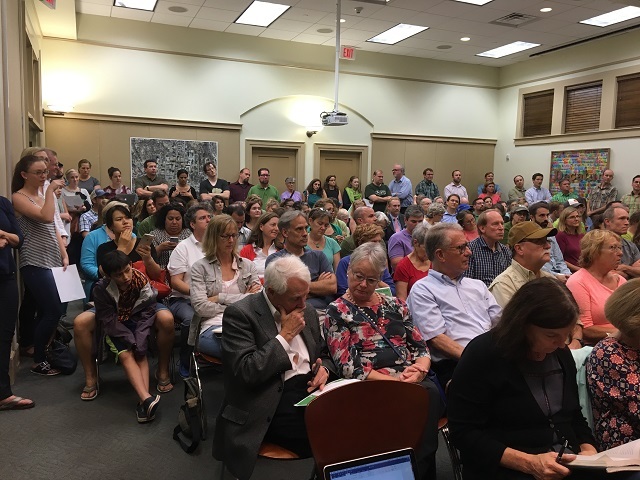 After three hours of discussion and public hearings on Monday, Decatur’s Zoning Board of Appeals punted on a decision to allow development plans near Dearborn Park to move forward. Nearly 200 people packed the room at City Hall, lining the walls and sitting on the floor during the meeting that continued until after 11 p.m. More than 20 people spoke during the public comment, voicing their opposition to the proposed development. HausZwei Homes had been a contributor to Dearborn Park for years having sponsored several clean ups throughout the years and donating the shrubs that were planted along Deerwood Drive in Midway Woods. We hope they can be resolved in a manner that will benefit both the park and the neighborhood. At issue is a nearly 4-acre proposed development site at West Dearborn Circle and Chevelle Lane. Kudzu Capital LLC purchased the land in June 2016. The property is divided into 16 lots, but does not have a road that provides easy access to the lots. Kudzu filed for a variance from the requirements of the city’s Unified Development Ordinance to allow for a private driveway onto the property.